Marbles Kids Museum has purchased some property nearby with plans to expand. The building adjacent to the courtyard next to Marbles will be home to the expansion. This comes in addition to their plans for another courtyard at the corner of Morgan and Blount Street. Marbles is a huge asset to downtown Raleigh and there are ways to experience Marbles whether you have children or not. Even today, I think Marbles is a stop for any families visiting downtown Raleigh. ← Previous Post Reader Meetup on Wednesday 10/4! Isn’t the building next to the courtyard currently Longleaf School of the Arts? I heard awhile back that the school was planning to move at some point, but it doesn’t appear to have happened yet. Thanks Leo for setting up a terrific meet and greet. Despite no comments to that post, you had quite the turnout! The N&O posted an article yesterday detailing plans for a 5 story luxury condo development. 525 S. West St. That whole area will drastically change in 3 years. @Drew. Steve beat you to that yesterday in the comments on another post. That said, I’ll repeat my call for the connection of West Street from north to south. As of now, there’s no N/S connection between this area between Dawson and Boylan. 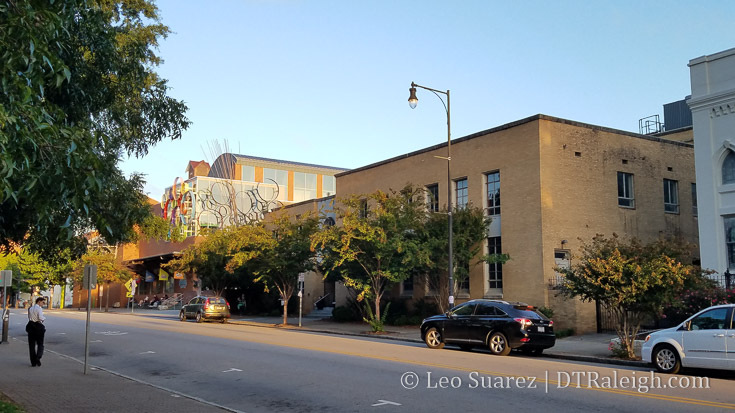 A West St. connection would open up the world for this emerging neighborhood, the Warehouse District and Glenwood South. link to the exterior drawings?